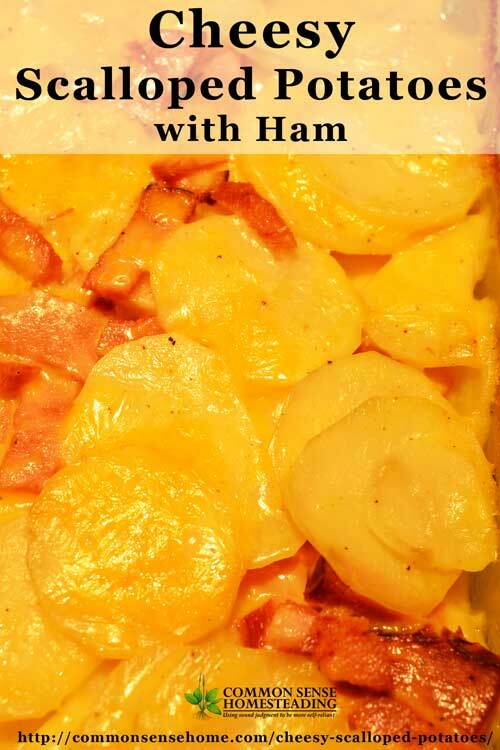 Scalloped potatoes were a holiday tradition when I was growing up. Every Christmas Eve we would have fried fish, scalloped potatoes and oyster stew, along with an assortment of other homemade goodies. Holidays were a time of celebration and plenty. No matter how many people showed up, no one ever went home hungry. The scalloped potato recipe I use is similar to the one my mom used to make, spiced up with a bit of curry and some cheddar cheese. Sometimes I also add ham if I have some on hand, and serve it with veggies on the side for a meal. Grease a 9×13 pan (preferably Pyrex or ceramic) or 3 quart casserole dish with butter or lard. Preheat oven to 350 F. Peel or scrub potatoes, slice thinly. Place potatoes in cold water while you make the sauce. To make the cream sauce. 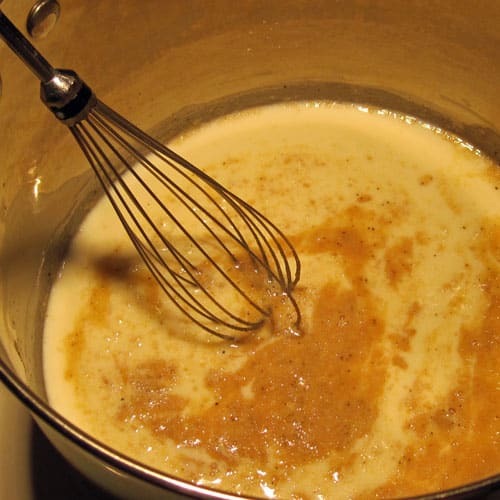 Melt butter over low heat in a medium to large heavy saucepan (one that has room for the potatoes), stirring frequently with a wooden spoon. Blend in flour, pepper and salt. Cook over low heat, stirring until mixture is smooth and bubbly. Bring mixture to boil, stirring constantly. Boil one minute. Mixture will become thick and creamy. 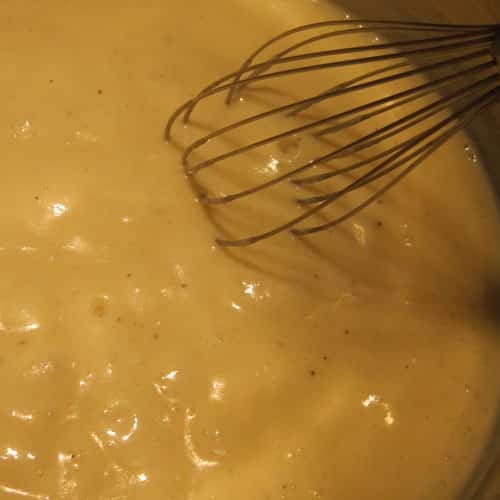 This is a basic white sauce. Add onions and curry powder (if desired) to the sauce. Drain potatoes thoroughly in a colander (I like my over the sink strainer). Pour potatoes into hot warm sauce, toss to coat. At this point, you can either add the shredded cheese right in the sauce pot, or add in in layers as you place the potatoes in the pan. Stir in ham, if desired. I usually homemade mozzarella or cheddar cheese. Cover with foil (or lid) and bake for around one hour, until center is bubbling. Remove foil and bake ten minutes more to brown the top. Remove from oven, let rest for 5 to 10 minutes before serving. Serves 8-10. 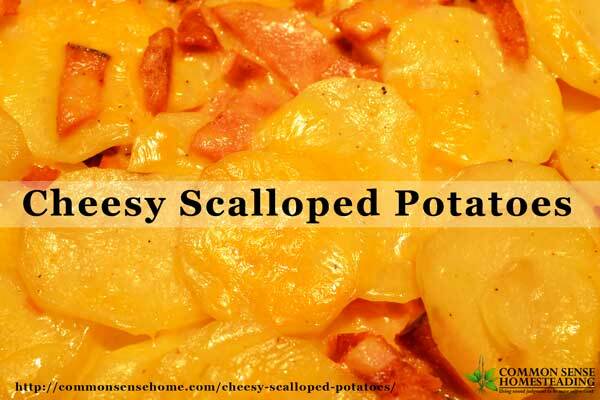 This homestyle dish is sure to please with loads of hearty potatoes and creamy cheese sauce. Grease a 9×13 pan or 3 quart casserole dish with butter or lard. Preheat oven to 350 F. Peel or scrub potatoes, slice thinly. Place potatoes in cold water while you make the sauce. Bring mixture to boil, stirring constantly. Boil one minute. 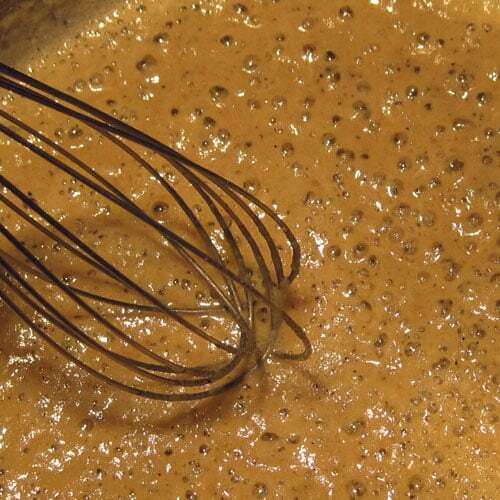 Mixture will become thick and creamy. Add onions and curry powder (if desired) to sauce. Drain potatoes thoroughly in a colander. Pour potatoes into hot warm sauce, toss to coat. Add ham, if desired. At this point, you can either add the shredded cheese right in the sauce pot, or add in in layers as you place the potatoes in the pan. Cover with foil or lid and bake for around one hour, until center is bubbling. Remove foil and bake ten minutes more to brown the top. Remove from oven, let rest for 5 to 10 minutes before serving. Do you have a favorite holiday potato dish? I am so intrigued by this. 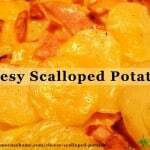 I have so much trouble finding scalloped potato recipes, or making them myself that are those from my childhood. I will have to give this a go. Thank you for sharing them. As for my favorite holiday potatoes, I am going to go with a traditional choice, but with a twist. I love camembert mashed potatoes. Happy holidays! Leftover scalloped potatoes make the best and easiest Potato Soup ever. Just add more milk and blend to desired consistency. Shredded old cheddar cheese to top. Thats it. Sounds wonderful. I will try it this thanksgiving. I like to fix the cheesy potato (funeral potatoes), casserole for a Christmas breakfast. Or Thanksgiving too.